Networking 101 - Who Created the Internet? 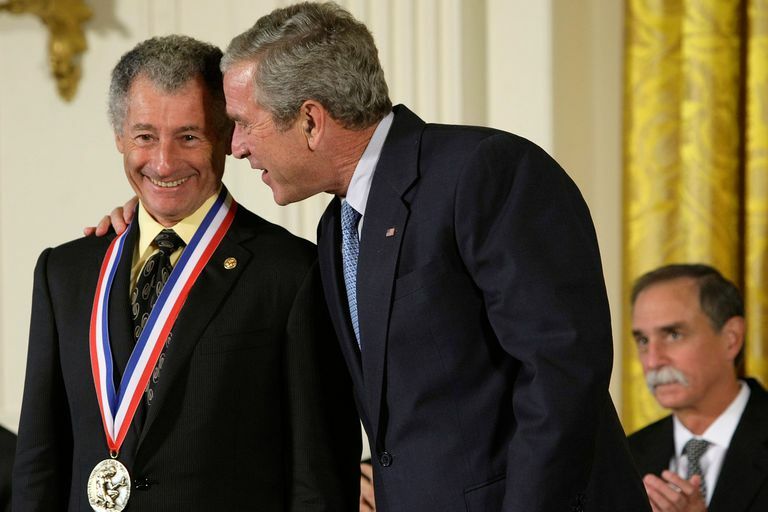 President George W. Bush (C) talks to computer scientist Leonard Kleinrock (L) after presenting Kleinrock a National Medal of Science. The term Internet today refers to the global network of public computers running Internet Protocol. The Internet supports the public WWW and many special-purpose client/server software systems. Internet technology also supports many private corporate intranets and private home LANs. ARPANET - created with funds from the U.S. Department of Defense, the Advanced Research Projects Agency Network pioneered the early development of packet switching networks. Work on ARPANET began in 1969 and continued until the network was shut down in 1990. Well-known individuals involved in ARPANET included Leonard Kleinrock, who may be the first person on the Internet to have sent an illegal online message. BITNET - the Because It's There NETwork was formed by two U.S. universities and later joined by others. BITNET worked exclusively over dial-up connections and was active from 1981 to 1996. CSNET - the U.S. National Science Foundation formed the Computer Science NETwork in 1981 to support university research. CSNET operated until 1991. The development of the World Wide Web (WWW) portion of the Internet happened much later, although many people consider this synonymous with creating the Internet itself. Being the primary individual associated with the creation of the WWW, Tim Berners-Lee sometimes receives credit as an Internet inventor for this reason. In summary, no single person or organization created the modern Internet, including Al Gore, Lyndon Johnson, or any other individual. Instead, multiple people developed the key technologies that later grew to become the Internet. Email - Long before the World Wide Web, email was the dominant online communication method. Ray Tomlinson developed in 1971 the first email system that worked over the early Internet. TCP/IP - In May 1974, the Institute of Electrical and Electronic Engineers (IEEE) published a paper titled "A Protocol for Packet Network Interconnection." The paper's authors - Vinton Cerf and Robert Kahn - described a protocol called TCP that incorporated both connection-oriented and connectionless services. They didn't realize it at the time, but the protocol they invented would later become known as TCP/IP - the official network layer protocol of the Internet. The prominent role of TCP/IP on networks today leads many people to associate Cert and Kahn as the inventors of the Internet.